MSPs have rejected plans for income tax rates to increase by 1p in Scotland from April of this year. Labour and the Liberal Democrats had said the move would raise £500m to safeguard education and other public services. But Finance Secretary John Swinney said increasing income tax would punish Scotland's lowest-paid workers. He has vowed to keep income tax rates the same as the rest of the UK for the time being. Mr Swinney was speaking as MSPs debated his draft budget for the forthcoming financial year, which marks the first time Holyrood ministers have been required to play a part in determining income tax rates in Scotland. MSPs backed the general principles of his budget and rejected a Labour amendment calling for the new Scottish Rate of Income Tax to be set at 11p - a penny higher than the rest of the UK across all bands. Scotland's tax powers: What it has and what's coming? 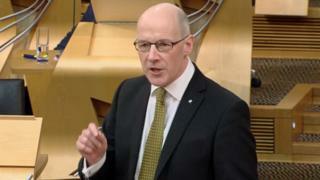 Speaking at the start of the budget debate, Mr Swinney said the Scottish government's longer-term financial decisions were influenced by the expectation of further powers, including over income tax rates and bands, being devolved under the Scotland Bill which is currently going through the UK Parliament. He added that his budget was aimed at delivering a "strong and sustainable economy" while tackling economic inequality. Mr Swinney said: "The limited nature of the income tax power currently available to the Scottish Parliament only allows for a single rate to be set and then applied to all three income tax bands. "This means that any increase on the wealthiest would also apply to the lowest income tax payers. Proposals from other parties to increase income tax by 1p next year will hit those tax payers least able to pay." Mr Swinney also said that the "last thing he was going to do" was put up taxes for teachers and public service workers who have "had to endure pay constraints because of the austerity programme of the United Kingdom government. He added: "The uprating of the living wage, its extension to social care workers and an uplift of £400 for those covered by public sector pay policy earning £22,000 or less will see tens of thousands better off because of this budget." Scottish Labour had tabled an amendment to the budget, calling for the Scottish rate of income tax to be set at 11p, a penny more than the rate proposed by the SNP administration. Image caption Jackie Baillie described Mr Swinney's budget as "austerity on stilts"
Labour argued that this cash would help avoid cuts to schools and other local public services. The party's finance spokeswoman, Jackie Baillie, told the Holyrood chamber that teachers were "doing their own photocopying, buying jotters for the classroom - there are no resources in our classrooms". Ms Baillie said these teachers "absolutely understand" the calls for income tax to be raised in order to defend education budgets, and pointed out that her party had proposed a £100 rebate for the lowest-paid workers. She claimed Mr Swinney's budget was "austerity on stilts", but told him: "It is not too late for the SNP - we could work together to end Tory austerity in Scotland. "You used to want to do so - to invest in our children, to invest in our economy, to invest in our future. "For all his noise, he [Mr Swinney] knows how painful these cuts are, and he knows he doesn't have to do this." Labour's plans for a 1p rise in income tax were unveiled days after the Scottish Liberal Democrats proposed increasing the levy to help fund education. Scottish Lib Dem leader Willie Rennie said Mr Swinney now had the powers to "do something about" austerity, but had refused to use them. Mr Rennie added: "He is imposing the kind of budget that he has previously condemned. "The people of Scotland will know that his refusal to act means that every single cut to public services in Scotland is a John Swinney cut. He cannot point anywhere else any more." Murdo Fraser of the Scottish Conservatives pledged to resist any increase in taxes, and said Mr Swinney was right to keep income tax rates at their current levels. But he added: "We know the Scottish government will always complain it does not have enough money, and we know they will always put the blame for this at Westminster's door. "The difference in this budget is that the finance secretary could have made the choice, if he wished, to increase taxation and he chose not to do so." Patrick Harvie of the Scottish Greens credited both Labour and the Liberal Democrats for recognising that revenue would need to be raised in order to protect public services. He added: "Simply managing cuts from Westminster and blaming the UK government - which is, to be fair, culpable for the deeply wring and damaging actions it is taking - is not enough. "We have to know what to do about it and raising revenue is going to be an important part of the response". MSPs voted to back the general principles of the Budget Bill by 63 to 46, with 15 abstentions. The amendment from Labour, calling for the Scottish rate of income tax to be set at 11p for 2016-17, was defeated by 81 votes to 43.